Coming off the heels of a highly anticipated split with fellow Texan group Wildspeaker, Cara Neir 's newest full-length, Perpetual Despair is the Human Condition, will be released through Broken Limbs on October 14, 2016. Cara Neir has been building steam since 2013's Portals to a Better, Dead World. Listeners were treated to a full immersion in the band's genre-defying, constantly evolving sound, meaning each new record is a treat of the unexpected for even the most seasoned fan. Perpetual Despair... is no exception. This new album showcases a more mature sound, while still maintaining the band's intensity and venom. This is Cara Neir at its peak. Popmatters on Portals To a Be tter, Dead World: " The stygian, genre non-conforming hybrid of black metal and punk on Cara Neir's latest makes for a hard-to-pigeonhole, easy-to-love album that might just be the best metal recor d put out all year." Cara Neir is a two-man project formed in 2008 based in Arlington, Texas. 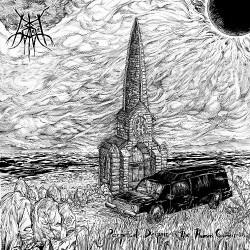 Unrestrained by genre barriers, the band has incorporated a revolving door of stylistic shifts in black metal, punk, screamo, grind, and hints of post-rock throughout its discography. Structurally, Cara Neir is multi-instrumentalist Garry Brents complemented by the introspective and galvanizing lyrics of Chris Francis.